What Is DA Form 2166-9-1? DA Form 2166-9-1, NCO Evaluation Report, SGT is a U.S. Army form used for rating and evaluating Non-commissioned officers (NCOs) after their promotion to Sergeants (SGT) including promotion to SGT following a reduction. This form is one of the several Army performance evaluation reports in the DA 2166-9 series. The form requires an evaluating officer and a senior rater to provide their assessment of the NCO's yearly performance and potential. An evaluation by a supplementary reviewer can be added if required. The latest version of the form - sometimes mistakenly referred to as the DD Form 2166-9-1 - was issued in November 2015 by the Department of the Army (DA). 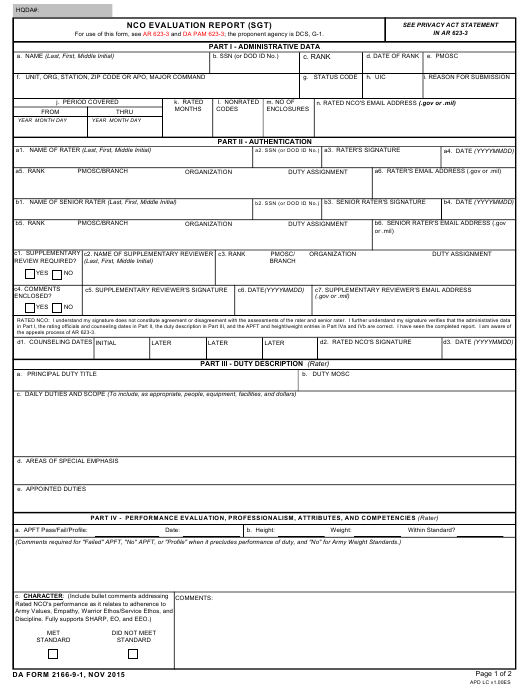 An up-to-date fillable DA Form 2166-9-1 is available for download below or can be found on the Army Publications Directorate website. 623-3; the proponent agency is DCS, G-1. The DA Form 2166-9-1 is regulated by the Department of the Army Pamphlet 623-3 (Evaluation Reporting System) released in November 2015. The information within the form is divided into five categories. This includes administrative data, authentication, duty description, performance evaluation and an assessment of the officer's potential for growth and development. The first part of the form requires the evaluated NCO's personal information. The rater should provide the name, e-mail address and social security number of the NCO, information about their unit, rank, the reason for submission, the periods covered by the evaluation, the number of rated months, nonrated codes and number of enclosures. The second part includes information about the rater and senior rater. This section provides their names, social security numbers and email addresses. There is additional space for specifying their rank, service branch and organization. Both parties should sign and date the document correctly in the appropriate columns. In case the evaluation process requires a supplementary review, an entire section of the second part of the form is dedicated for the information about a supplementary reviewer. The final sections of the form are to be completed by the person in charge of performing the evaluation. After all sections are filled in and completed, the person making the evaluation should provide an overall rating of the NCO's performance. This should include an assessment of the Sergeant NCO's potential for growth with the options being "most qualified", "highly qualified", "qualified" or "not qualified". The section near the box for rating also provides space for any additional comments concerning the evaluation and the particular NCO's potential and performance. The form is to be certified with all applicable signature and dated correctly before submission.